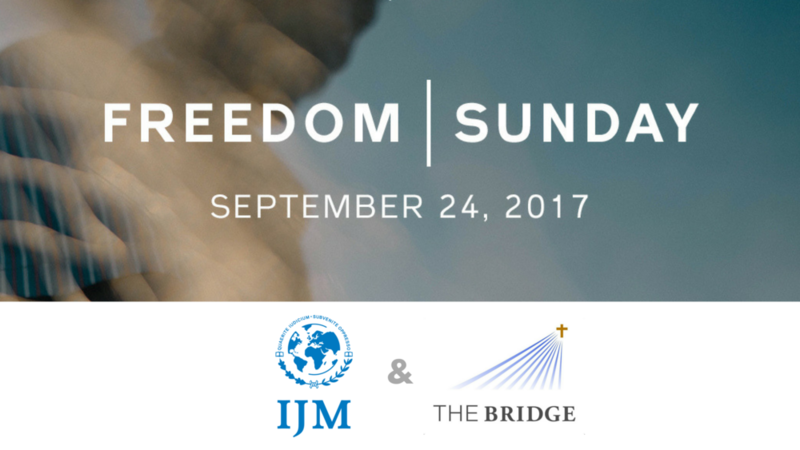 This Sunday, along with thousands of other churches across the world, we will devote our 10 AM worship gathering at The Bridge to God's call for us to seek justice in partnership with our friends from International Justice Mission. We will hear the latest from IJM, sing songs of worship together that celebrate God's power at work in the world, Steven will preach on Scripture that highlights the kingdom of God here and hereafter, we will pray together for IJM and those still enslaved, both spiritually and physically, and hear from one of our own about her story of injustice, oppression, and freedom. There will be tables with information about IJM in the lobby and ways you can respond if you feel led. More than 45 MILLION people are TRAPPED IN SLAVERY RIGHT NOW. This is more than at any other time in human history. Just as saints who have come before us have sought freedom and justice in the name of Jesus, we stand today as the body of Christ at work in the world. We take seriously the call for God's people in Isaiah 1:17 to seek justice, rescue the oppressed, defend the orphan, and plead for the widow. In the midst of our sin and brokenness, we have been rescued by a Savior who loved us enough to die for us. As we have been rescued, so we offer rescue - spiritually and physically - to those still in chains. We are facing a task unfinished, friends. This Sunday. 10 AM. The Bridge. To learn more about IJM, please visit www.IJM.org.